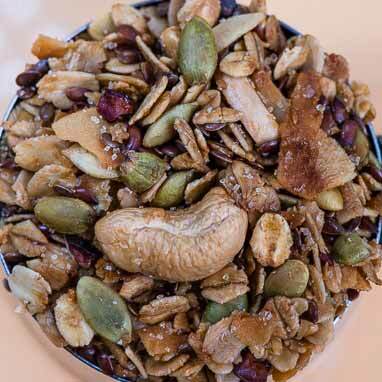 Making your own granola is easy and way more delicious than commercially made granola. This recipe delivers a wonderful flavor highlighted by toasted coconut flakes. After this granola has been stored a day or two you will notice the chocolate flavor of the cocoa nibs infusing every spoonful. Note: Experimenting with this recipe is easy and fun. You can substitute any kind of seed or nut—walnuts, for example, work great. You can also change the amount of toasting with this (or any granola) to suit your taste.